HÀ NỘI — Telecom and internet providers in Việt Nam have recorded US$6.1 billion in revenue and created more than 851 jobs, experts said at a forum on enterprises in the digital age held in Hà Nội on May 17. 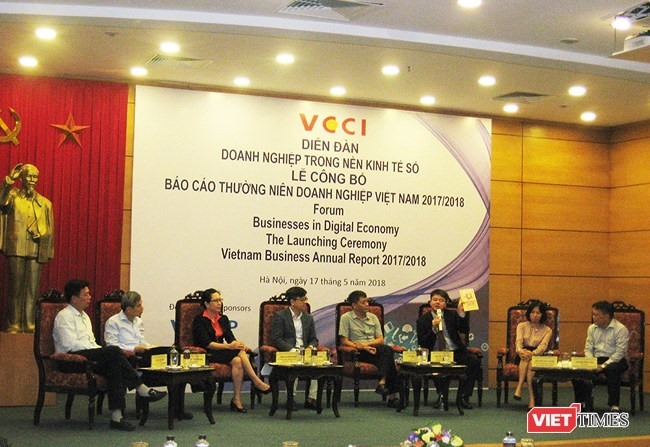 The forum took place in conjunction with the announcement of the Vietnam Chamber of Commerce and Industry (VCCI)’s annual report on business in Việt Nam. The IT and telecom sector’s production value contributed over 0.7 per cent to the nation’s GDP on average in 2017-18. In 2016, the number of IT/telecom businesses surpassed 11,000, accounting for 2.2 per cent of Việt Nam’s total figure. Apart from the application of advanced technologies in traditional sectors, the digital age has given birth to a number of non-traditional business models in Việt Nam, like online car hailing and financial technology (fintech) services. Expert said fast changes in these new models have sometimes outpaced legal regulations, thus causing difficulties for their providers and conflicts between them and their traditional peers. VCCI Chairman Vũ Tiến Lộc said last year, the Prime Minister issued Decree 16 on capacity building for the Fourth Industrial Revolution. He said the decree put forth key measures on IT infrastructure development, and prioritised the building of digital industry, smart agriculture and smart cities. He noted companies ought to design their relevant action plans and join the public sector’s efforts in building strategies for smart governance and innovation. Lộc also acknowledged the achievements of the business sector last year, with the establishment of 126,859 new firms, the highest number recorded to date.